Everything you need to know is there....So, if you want to know more about Showrunners, or if you have an idea and you're determined to be- come the next David Kelley or Terence Winter or Vince Gilligan, I recommend you get a copy of Cy's book. ... heart, humor, or human interest. It has all three, and on nearly every page. It’s not like other books that discuss what a producer is without having a personal touch. It’s a fast read that retains interest by taking readers behind the scenes of TV production from a very knowledgeable insider’s perspective. Again, this is a book that’s not just for future showrunners. It’s for anyone who likes to go behind-the-scenes of TV production. " 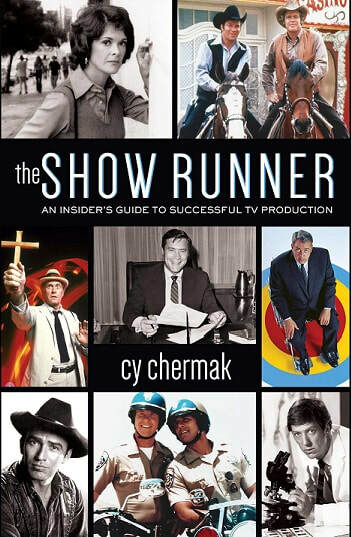 "The Show Runner is an obvious recommendation for students of television history and a suggested selection for film studies coursework....Cy Chermak–TV executive producer, producer, story editor, and writer [offers] a step-by-step narrative providing an insider’s view of show process and studio politics in his new book The Show Runner: An Insider’s Guide to Successful TV Production." “His stories are wonderful, insightful, humorous, and full of vital knowledge for anyone who hopes to produce a series. He goes into the real nuts-and-bolts, from how to craft a television story, creatively and to fit a production budget, to how to watch dailies, pick locations, deal with actors, manage your time, and work with studio executives. This is a highly-entertaining, information-packed, must-read for students of both television history and production. I wish I'd been able to read this book before I ran my first show...it would have saved me a lot of pain.” Lee Goldberg #1 New York Times bestselling author and the show runner of Diagnosis Murder, Martial Law, and Missing, among others.